Art is life and life is art. That sounds like hyperbole but Yuko Nakamura’s documentary, A Room of Her Own – Rei Naito and Light, takes a look at a remarkable artist’s extraordinary installation work which uses light and delicate objects to make life-affirming works that give insight into the world and human existence. Again, sounds like hyperbole but this film is inspirational in the way its shot and reveals a lot about its subject even if she remains a mysterious figure. Nakamura takes audiences to the genesis of this project, when she learned she would have to support her terminally ill mother. While contemplating how to look after her parent and feeling the serious weight of her connection, she took a trip to Teshima Art Museum, on an island in the Seto Inland Sea, and she encountered an integrated artwork named “Matrix” by architect Ryue Nishizawa and artist Rei Naito (more info). The visit was a profound moment that gave Nakamura an insight into life but how to explain it? How to understand it? How to understand the artist, Rei Naito? A film had to be made. Nakamura’s documentary takes in two year’s worth of work, from the initial idea and contact with Rei to the growing relationship between film-maker and subject as they travelled together and corresponded. Nakamura was the first person to document Rei Naito’s process since she had previously refused to be filmed on camera. Careful about her privacy, Naito’s presence is usually glimpsed or shot at an odd angle so we never see her clearly but it isn’t long before the subject disappears off-screen. Her mysterious nature is not feigned for the camera. 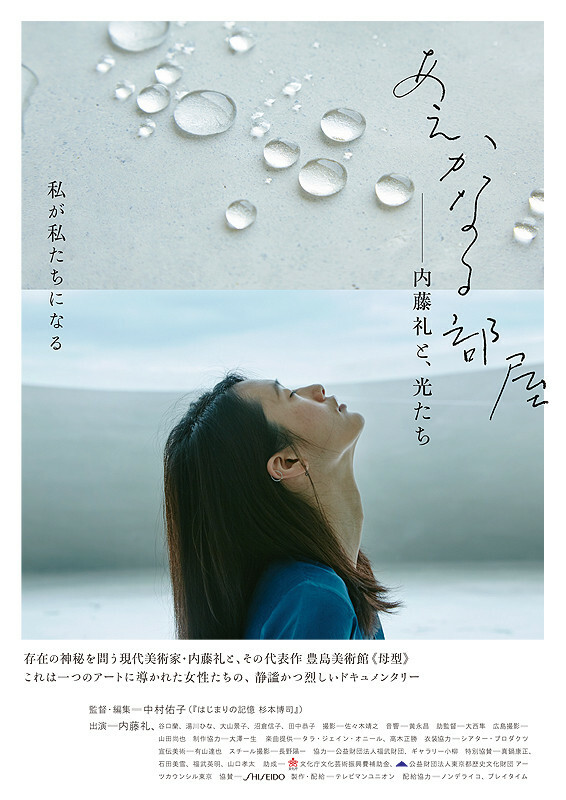 From the person Nakamura displays, one gets the sense that she is naturally reticent, a deep thinker gradually opening up to the universe, something the film’s chronological re-tracing of her career from deeply personal works like light installations that acted as havens for herself such as One Place on Earth (1991) to her most recent exhibition at Hiroshima Prefectural Art Museum which combines figures Naito began to carve after the Great East Japan Earthquake and Tsunami with bottles that survived the atomic bombing. Seeing simply carved figures stood next to these melted objects is haunting but also hopeful – life continues and is precious, an idea Naito’s narration backs up. After this, Nakamura is left alone as Naito retreats into her own world and is represented by emails and letters forming on-screen epistolary between the two creatives. Despite not being on camera, Naito’s presence is heavy and her words reveal aspects of her character and her constantly changing thinking. Her absence, more interestingly, forces Nakamura to rise to the challenge of showing her response to Naito’s work in an unconventional way. For the second part of the documentary, Nakamura uses the model Ran Taniguchi and shoots her like a fashion model in both the city and countryside. The director then introduces a group of four women of different ages and examines their thoughts on life before introducing them to Naito’s work on Teshima. Having figures to follow fills in Naito’s absence but it also helps the audience come to some understanding of how powerful her works are as we get their perspectives. These sequences form something of a travelogue and a series of biographies which capture a multitude of perspectives, from a middle-aged nurse and an editor who suffered a near-fatal accident, to an elderly woman talking about life from the end of the Second World War to a fourteen year-old basketball star facing her future. Shot with wonderful immediacy, delicacy and some staging – a costumiers must have been hired for the Teshima shoot – the different people in the film all get the chance to speak, affirming their existence and becoming one as their voices are mixed together and form a chorus about the process of coming to terms with death and weakness and accepting the mysteries and joys of life. Thus, they can value their connection with themselves and others. Everyone examines a fear or weaknesses but finishes on a note of hope. Not all are able to explain how the work affected them but it is enough to grasp that it has been a profound and interesting experience. The film is always interesting. It is incredibly cinematic from the aforementioned use of on-screen text, emails and so forth to using handheld cameras and cameras on tripod. There are a plethora of POV shots, rough documentary footage picked up from the cutting-room floor after Naito’s escape, and some glorious work that would be perfect in feature films – pans and wide-angle shots to scope the many beautiful locations, tracking shots to keep up with Ran Taniguchi and the others as they travel. The visual aspect is never boring. 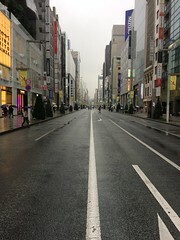 As active as the camera is, Nakamura also uses cinema to highlight the art by capturing images of Naito’s work from all angles, in all weathers, and in different lights. She displays things for the audience to concentrate on and appreciate, keeping the camera still, close-up and removing all sound, highlighting the delicacy and the tactility of things. This is a sensitive art documentary intent on showing examples of Naito’s work. Nakamura finishes by returning to Naito and revealing more of her influences such as the French philosopher Simone Weil. Thus, her transforming art makes more sense. As we get this greater understanding, Nakamura talks about her mother and how the project released her thoughts and spirit. Through chasing a distinguishing line between life and creation in Naito’s work, Nakamura and Naito both show the process of letting the borders between art and life collapse – to be alive is to create, to create is to be alive. Whatever results is beautiful. In all the years I have worked in an art museum, nothing I have had to explain to visitors has spoken to me about the act of creation as much as this film and I look forward to exploring Naito’s work more. I hope you do too. I probably haven’t done this documentary justice. It’s a great work that captures something of the artist and her work. I hope you can see it. Here’s an interview with Rei Naito.